How many photos can you take during a trip? With the arrival of digital cameras, that number is probably in the thousands. Are you going to be sharing those one by one? Why don't you make a collage? 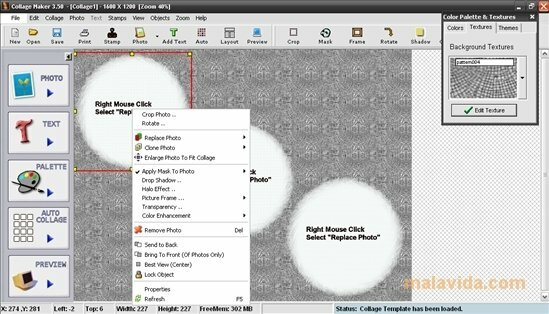 Photo compositions are fun, and with Collage Maker they will also be easy to create and provide great results. Instead of wasting time with complicated editing programs, what could be better than to get everyone's attention with a photo in a great frame? 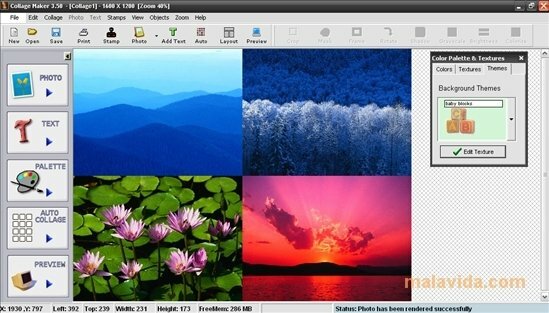 With Collage Maker you'll be able to choose icons, stamps, frames and as many backgrounds and textures as you want. On top of this, the text editor tool will allow you to include the odd title or even speech balloons with a funny quote. Collage Maker helps users with less experience to create photo compositions with their photos that can later be printed and shared anywhere, with a simple interface and well chosen functions, results are excellent and the collages are worthy of professionals.